Multiple camps with full day and half day options are available starting June 3rd, 2019 for the entire Summer season. 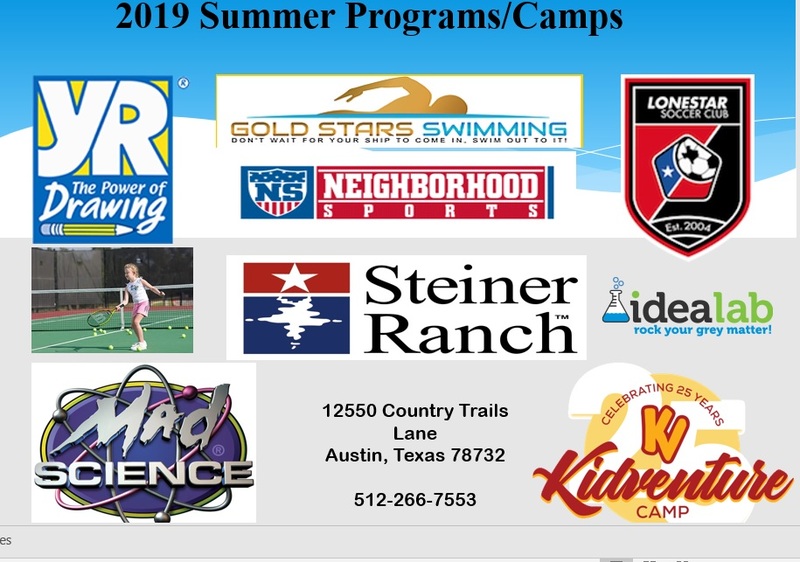 Kidventure – Mad Science – Lonestar – Neighborhood Sports – Steiner Stars – Gold Stars Swimming - Young Rembrandts Youth Art - IdeaLab …. We are proud to announce that Kidventure Summer Camp is returning to Steiner Ranch for the Summer of 2019. Camp Steiner will offer 9 weeks of active and rewarding summer camp for all children ages 6-12. Families have the opportunity to register for any of the camp weeks, but each is designed to be a unique adventure, providing your child with outstanding opportunities for athletic, educational and personal growth. Young Rembrandts is the Art program that is now offering classes this Summer at Steiner Ranch. It teaches fundamental drawing techniques. It is a proven method, step by step curriculum and tiered lessons plans for a sequential, ordered teaching process. For the Camps Brochure, click HERE.